HWT Gothic Round is the newest release from the Hamilton Wood Type Foundry. The font, a softened variation of a standard heavy Gothic typeface was first introduced as wood type by the George Nesbitt Co. in 1838. The style evokes a much more recent history of the 1960s and 70s and can be seen in such places as donut shops and on children's toys as well as inspiration for such fonts as VAG Rounded. 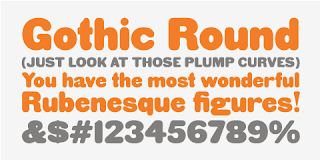 Gothic Round has not previously been available as a digital font until now. The font was digitized by Miguel Sousa from a wide variety of historical sources, including visits to the Cary Collection at RIT (Rochester, NY), WNY Book Arts Center (Buffalo, NY) and the Hamilton Wood Type Museum (Two Rivers, WI). The result is a very solid and contemporary font with a 175 year history. Visit the Hamilton Wood Type Foundry website for more information about this release or check out our Behance page for photos and more background info on the development of this font from wood type to digital. 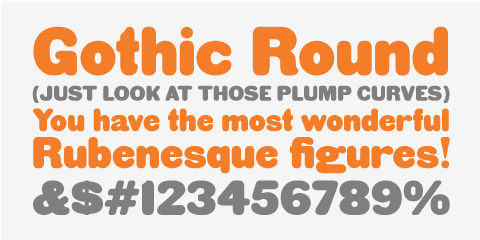 HWT Gothic Round is available at an introductory discount through October 31st.